A number of ethnographic and archaeological studies have illustrated how broader beliefs and worldviews are expressed in secondary mortuary practices and often reflect aspects of ancestor worship and responsibility to the deceased (see Crocker 1977;Hertz 1960;Kan 1989;Kuijt 1996;Lopatin 1960; Metcalf and Huntington 1991; Weiner 1976). Within this paper secondary mortuary practice is defined as a social act focused on the regular and socially sanctioned removal of objects, pieces, or entire remains of a deceased individual from some place of temporary storage to a permanent resting place. Physically this is expressed by the intentional removal of skeletal materials from one location to another location and is often, but not always, represented by the recovery of disarticultated and relatively incomplete skeletal remains. It is important to keep in mind, however, that primary and secondary mortuary practices need not be mutually exclusive from a classification standpoint (especially given that they are usually perceived by ethnographic groups as being interlinked as parts of a broader belief system). Although the means and rationale behind secondary mortuary rituals varies considerably between ethnographic groups, secondary mortuary rituals throughout diverse cultures impact individuals within and between households of a community as an extremely powerful means of defining, shaping, and maintaining identities and social relationships. One aspect to this is that, even if they focus on specific individuals from separate households, secondary mortuary practices involve, be it perceived or unperceived, an element of communal ancestor worship as part of a collective social memory and identity. The broader articulation of a shared identity requires the message be conventionalized as well as simplified so as to make it understandable to all. This is partially accomplished by reference to generalized ancestors and the development of highly standardized social rules. Importantly, secondary mortuary practices permit scheduling of funeral events at a pre-arranged time that does not conflict with other tasks, and are at times envisioned as a season of festivities (Hertz 1960;Metcalf and Huntington 1991).This facilitates extensive co-participation in secondary mortuary events from within the community as well as for initial primary mortuary events and by extension, broader recognition of a worldview and beliefs (Figure 1). Figure 1 Generalized stages of Pre-Pottery Neolithic primary and secondary mortuary practices. Note differences in timing, communityparticipation, and possibilities of coparticipation by multiple households. In many societies secondary mortuary practices are organized to facilitate participation in community events that cross-cut kin and household lines (Downs 1956;Hertz 1960;Hudson 1966;Metcalf and Huntington 1991). Among the Ma'anyancf Borneo, for example, corpses from different households are removed from a primary burial context after a number of years and are collectively given funeral rites as part of a week-long community festival (Hudson 1966:361-98).Similarly,Downs (1956:78-91)outlines how community level secondary mortuary practices occur among the Toradja of central Celebes for deceased individuals from multiple households. These studies reiterate that broader beliefs and worldviews fundamentally affect and perpetuate secondary mortuary practices. Ultimately,these ethnographic data illustrate how purposefully ritual practitioners and communities organize secondary mortuary rituals as part of high profile public ceremonies; therefore, we can view these as spiritual and symbolic acts that have social, political, and personal meanings. In contrast to primary, single-stage, mortuary practices, aspects of multi-stage secondary mortuary practices are planned in advance, often held in conjunction by multiple households as part of a community festival, and require extraordinary levels of community involvement. In observed ethnographic societies in which skull caching occurs, the secondary burial of the skull is often viewed as an obligation by the deceased's household and a necessary stage of a multi-year mortuary ceremony, requiring substantial participation from other households in the village and from neighboring communities (McKinnon 1991). Beyond these logistical dimensions, secondary mortuary practices, with the deliberate removal of some or all of the skeleton, such as skull removal, are often linked to broader beliefs in ancestor worship. For all of these reasons, secondary mortuary rituals differ from primary burial of individuals, as these ceremonies often crosscut kin and household lines, thereby emphasizing the community over the individual. Archaeological research at a number of major MPPNB settlements in the south-central Levant has revealed that mortuary rituals, including skull removal as a secondary mortuary practice, were organized as a series of elaborate mortuary ordering principles based on the age of the deceased. A review of archaeological mortuary data indicates that these practices focused on (1)the primary interment of adults, probably both males and females, in single graves, (2) the secondary removal and caching of many adult crania singularly and in groups, (3) the interment of infants in single graves, usually without cranial removal, and (4) the occasional internment of adults in extramural and intramural locations without secondary cranial removal (see Cornwall 1981; Kuijt 1995;Rollefson Chapter 7 this volume; Rollefson et al. 1992 for more detailed consideration of these themes). Previous studies have outlined that some of these mortuary systems originally emerged in the PPNA and the Late Natufian period (Belfer-Cohen 1991; Hershkovitz and Gopher 1990) (Figure 2). Excavations from the MPPNB occupations at Jericho and 'Ain Ghazal have demonstrated that after primary burial of adults community ritual practitioners often, but not always, later removed the skull. Primary interment of adults was usually associated with architecture, although not always so, and burials occurred without any grave goods (Figures 3 and 41, a pattern that is also seen at the MPPNB settlements of Beidha, Yiftahel, and Kfar HaHoresh (Byrd 1994;Garfinkel 1987,Goring-Morris 1991; Kirkbride 1968). Figure 3. Plan view of MPPNB structure in square M1, stage XV, phase lxxviii. Figure 4. Plan view of MPPNB structure in square EI, II, V, stage X, phase xxxvi. 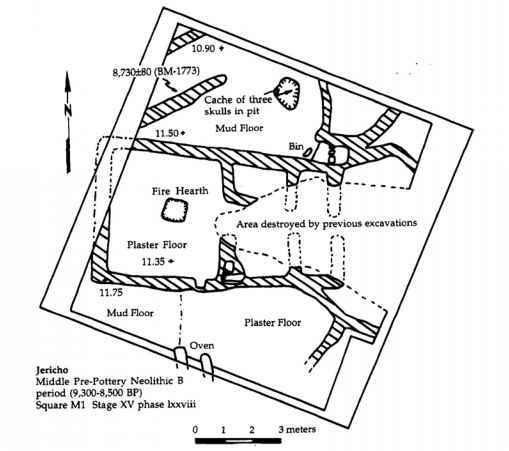 Note the location of human skull cache Ell- 16 in a courtyard area (see Figure 5). intentional or a coincidental by-product due to the repeated interment of individuals over time. 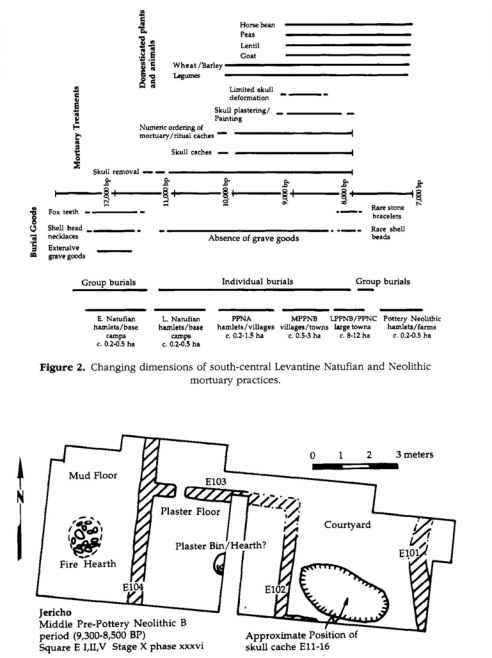 On other occasions at 'Ain Ghazal and Jericho, infants were clearly interred in a ritual context, such as in subfloor pit features and as dedicatory offerings within the foundation or the walls of a building (Cornwall 1981; Rollefson et al. 1992). In considering the function and context of, and meanings for, Neolithic caches, archaeologists have adopted a range of interpretive approaches. Describing ritual caching in the Neolithic period, Garfinkel (1994) adopts a functional perspective, believing that ritual caches in the Middle Pre-Pottery Neolithic period represent discarded objects worn out though ritual use. Undoubtedly Garfinkel is correct in arguing that many cultic objects were used in a ritual context before caching, but at the same time this descriptive work is less than satisfying since it provides no convincing evidence to suggest that all painted and plastered skulls were worn out in ritual use before burial. Most of the skulls recovered at Jericho, for example, were remarkably well preserved and, in many cases, still possessed intact shell inlays for the eyes and clearly visible lines of paint. More importantly, while many previous treatments have focused on the depositional context of materials, they often treat secondary burial systems and skull and anthropomorphic caches as isolated entities and, ultimately, fail to explore the more important past social context reflected by material culture. As with other researchers (e.g.,Bar-Yosef and Belfer-Cohen 1989;Cauvin 1994; Rollefson 1986; Schmandt-Besserat 1998), I argue that it is more profitable to view these cultic objects, skull caches, plastered skulls, and foundation offerings as a series of thematically interrelated aspects of MPPNB ritual beliefs and community ideology. Cultic objects were intentionally manufactured for use in ritual practices by the living, and rather than viewing ritual caching as refuse of worn-out cultic items, we can envision it as a later stage within a series of symbolic and spiritual acts that have social, political, and personal meanings. A wide range of cultic objects was purposefully manufactured by ritual practitioners for interment as part of highly visible public ceremonies focusing on the secondary burial of skulls of deceased community members and, therefore, can be viewed as a means of symbolic expression of a shared system of beliefs and values. One, but by no means the only, important dimension to secondary mortuary practices in ethnographic and archaeological contexts is that they are often deliberately held in highly visible public contexts to maximize participation in this shared experience in a meaningful way. In the case of Jericho, many of the skull and anthropomorphic caches appear to have been interred in extramural locations, although the excavation methods employed atJericho make it impossible to confidently reconstruct the location of all skull caches. Despite some ambiguity in the stratigraphic placement of different kinds of caches, current data indicate that many of the larger caches were situated outside of structures (see Chapters 4, 5, and 7, this volume, for further consideration). For reasons to be outlined later, I believe that all of these different dedicatory rituals involving caches were organized and implemented by one or more households and were geographically focused on extramural areas, such as courtyards, which furthered participation in these rituals by members of other households. In light of the physical location of skull caches in public areas and ethnographic accounts outlining the high degree of community participation in secondary mortuary rituals, I argue that these caches represent the physical expression of very important household-level ritual events organized for the veneration or worshipping of ancestors while serving to reaffirm relationships within and between households linked by marriage, political, and economic ties. 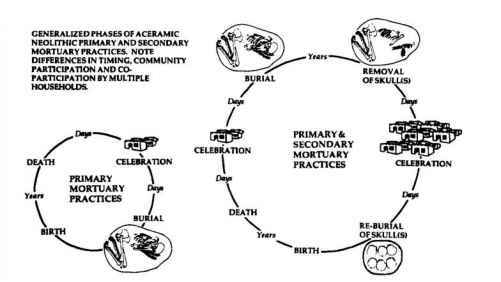 Examination cf the ways in which MPPNB households and communities physically and symbolically structured mortuary ritual provides us with insights into the high degree of standardization and, by extension, shared meanings within ritual practices through time (Figure 2). For example, in the MPPNB cranium removal was a reoccurring theme within communities that was physically and symbolically expressed in multiple media, including (1) actual skull removal as a secondary mortuary practice (e.g., 'Ain Ghazal, Jericho, Nahal Hemar, Yiftahel, and Catal Hoyuk), (2) symbolic pictorial representation of decapitation in wall paintings (e.g.,Catal Hoyuk), and (3) the actual decapitation of anthropomorphic figurines (e.g.,'Ain Ghazal,Jeri-cho, and Catal Hoyuk). MPPNB communities employed secondary mortuary practices that included special treatment of adults in mortuary practices, such as painting and plastering, and caching of human skulls in groups. Archaeological excavations at Jericho, 'Ain Ghazal, Nahal Hemar, and other MPPNB sites illustrate that, while skull removal starts in the Late Natufian/ PPNA, systematic collective skull caching in large numbers occurs predominately between c. 9,300/200 bp and 8,500 bp, with intermittent continued use through to c. 8,000 bp (Byrd and Monahan 1995; Kuijt 1995, 1996). Excavations at 'Ain Ghazal have recovered multiple examples of caches characteristic of MPPNB secondary mortuary practices. One example was recovered from beneath the floor from the southeast corner of the house in Sq 3083 (placed in a row facing away from the center of the room). In the same house, but in a separate room, a single adolescent skull was recovered from beneath the southwest corner of the floor. The rear portion of this cranium was thinly coated with black pigment, possibly bitumen (Rollefson 1986:51). A second cache of skulls from four individuals includes two that were plastered and was found in a burial pit in a courtyard context (Butler 1989; Rollefson 1986). The most extensive evidence for secondary mortuary practices in the MPPNB occurs at Jericho. Excavation of the MPPNB horizon resulted in the recovery of 232 skeletons (compared to 254 skeletons from the PPNA), with 33 skulls individually interred and 52 skulls recovered from 12 caches (Kurth and Rohrer-Ertl 1981).Reconsideration of Kenyon's stratigraphic subdivisions and the typical subfloorpit depositional context of individual caches at other MPPNB sites indicates that all but five cached skulls were associated with the MPPNB occupation at Jericho (see Kuijt 1995). The reoccurring theme of cranial removal in ritual practices is also seen in the decapitation and/or mutilation of anthropomorphic statues in south-central Levantine MPPNB communities. Excavations of MPPNB and LPPNB period (c. 8,500-8,000bp) sites often recover small clay anthropomorphic figurines. For example, the 'AinGhazal researchers have recovered many MPPNB human figurines, upwards of forty from the 1983-1984 season alone. Other than six human figurines, which Rollefson et al. (1992) classify as "fertilityfigurines,"most of the anthropomorphic figures recovered are heads or torsos, with no indication of secondary sexual characteristics. A stylized human figure (recovered from Sq 3282), roughly conical in shape with a mutilated head, typifies this assemblage. 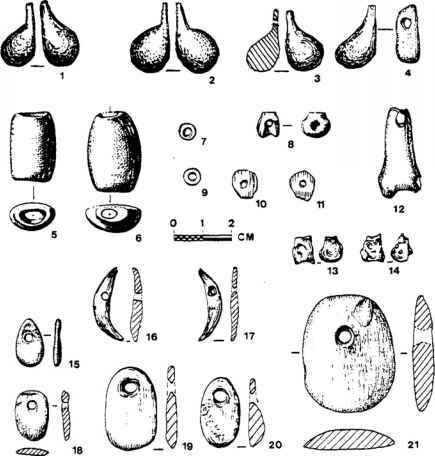 Other forms include the upper torso of a human figurine broken in half in antiquity (Rollefson 1986).Although fewer in frequency, human figurines have also been recovered at Beidha, including one female figurine (Kirkbride 1968:272).Similar observations have also been made at Catal Hoyuk in Anatolia in which multiple, if not most, figurines were recovered without their heads, a theme reiterated in both the famous wall painting of vultures and decapitated individuals and in the multiple wall sculptures where the heads appear to have been deliberately defaced (Mellaart 1967;Omura 1984;Voigt Chapter 11,this volume). Examination of damaged anthropomorphic figurines recovered in the excavation of Levantine Neolithic sites has led a number of authors to argue that in many cases these figurines were deliberately mutilated, damaged, or, in some cases, constructed so that there was no head (Bar-Yosef and BelferCohen 1989;de Contenson 1971;Goring 1991;Rollefson 1986,Chapter 7, this volume; Voigt 1983, Chapter 11,this volume). In examining different patterns of damage for various types of cultic objects, Voigt (1983:192) has argued that damage to anthropomorphic figurines is often " . . . due to 'killing' at the time of disposal." Similarly, Goring (1991:52) remarks that "the apparent associations between damage and burial leads one to seriously consider the possibility that this damage was deliberate and applied ritu-ally. "These authors offer persuasive arguments for the deliberate decapitation of small anthropomorphic statues. Viewed collectively, these observations reflect the importance of cranial removal as symbolically significant to Neolithic peoples, both with human burials as well as with figurines in Neolithic ritual practices over many thousands of years. Another important aspect to MPPNB ritual practices is related to the construction, dedication, and interment of large anthropomorphic statues in caches and the continued emphasis on real or constructed skulls, in this case expressed through deliberate emphasis of the face and head in statues. Anthropomorphic figurines have been recovered in excavations of Jericho, Ramad, and, most importantly, from 'Ain Ghazal. One of the more exciting results of the excavation at 'Ain Ghazal has been the recovery of multiple plastered human statues from three pit featureswith highly detailed naturalistic painting and molding of the face and heads (Grissom 1996; Rollefson 1986;Rollefsonet al.1992;Schmandt-Besserat 1998).Most of these figurines are half-size replicas of human skeletons or busts of the upper torso. The large human replicas have clearly formed legs and arms, and both busts and replicas were usually painted to draw attention to the elements of the face, even employing shells and bitumen for the eyes. Study of the methods of construction by Tubb and Grissom (1995) indicates that building these statues would have required considerable time investment. In the case of the statue cache from Sq 3282, eleven statues/busts were recovered, four in the lower layers and seven in the upper zone of the cache, from a pit that was cut through the floor of an abandoned house. Although the excavations of the MPPNB deposits at 'Ain Ghazal have not involved extensive horizontal exposure,Rollefson(1986) nevertheless has convincinglyprovided evidence to support the argument that these caches were from extramural locations. Although poorly preserved and from an unclear context, Garstang's (Garstang et al.1935) excavations at Jericho recovered anthropomorphic statues made of plaster in the context of four statue caches, two with three statues and two with single statues (Garfinkel 1994:164). As at 'Ain Ghazal, it appears that all of the caches from Jericho are from pit contexts. Viewed collectively, I believe that the deliberate focus on the head of these large statues, both in the construction as well as decoration, and the removal of the head of small figurines and the secondary removal of skulls from human skeletons, were all parts of an internally consistent shared system of ritual practices. As will be seen, this argument is based, at least in part, on the observations that many of these objects appear to have been buried in similar public contexts and that they are at times numerically organized along the same lines.